Today’s subject is not about me. 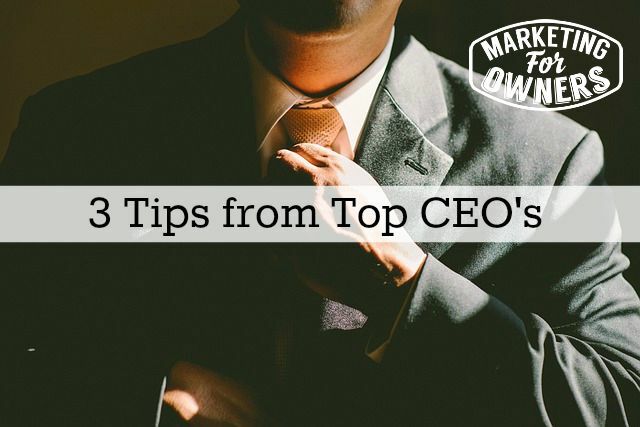 It’s about the top CEO’s, Chief Executives Officers, for those who are not in the business, acronyms. So, full credit to the BBC because I borrowed this from their website. They wrote a fantastic article on this two or three weeks ago. I thought I’d talk about it at some point. So, what they found, and this is a note to us all by the way, they wanted to interview top CEO’s but these people are busy. These people have schedules. They have to stick to them, they have to get through their stuff in the day. You think you’re busy. I think I’ve got a lot to do. Try running a multi-billion dollar company. Yeah, not easy. It sounds tough and you’d think they get a lot of money. They do, too much, but it’s still a busy job. It gives you grey hair. So, what is the advice you wish you’d had when you started out? What a fantastic question to ask any successful person. Interestingly, they all answered and gave good answers because as successful people, you may think are too scary to talk to or to ask anything about they’re local businesses,. Sometimes they feel unapproachable at a conference or anything, but if you ask them for information that makes it sound like you want to learn what they know and to become successful like them, they will want to help you. If you ask them for trade secrets or anything like that, they won’t. If you ask to borrow too much time, they won’t. But if you make it out that you want to be like them, how they can help, they will help you. Why do you think I do this? It’s not for the money, that’s for sure. The last time I checked, this is for free. It’s because I’ve done this stuff and there are loads of you out there who can do it too and I know how easy it is. I want you not to make my mistakes. You get a jump start by listening to the stuff I tell you. Listen to everyone else as well. Jump starts your business life, your entrepreneurial success and your bank account. So, I’m going to tell you what were the three clever things were. Three things came up. Number one, pick your team. So you can’t do it on your own. Now, I’ve tried to do it on my own in the past and I can’t. When I started Marketing for Owners, I started and built a team. I did not open any envelopes. I built a team. I still do work and I still guide the team but I built that team. The best line I have that I saw is, whatever it is that you are not, surround yourself with them. So that is the biggest lesson. Whatever you are great at, do that. Whatever you are not great at, hire people who are great at those. Get them. Don’t try to do that yourself. Remember, pick your team. Number two. Ready, steady, network. So what he’s saying is people make businesses, people make sales, people make contacts. People, people, people. Anyone you have ever met, anyone you are going to meet make the most of that opportunity. You never know who they will become. You probably don’t even know who they really are. Be nice. Help them. Don’t ask them for stuff. Help them become a resource to them. Don’t be the needy one. Help them in any way and if you think “How can I help them,” ask. Ask how can I help. Say, “You’ve given me so much information, so much help, so much. What can I ever do to help you back?” You will be amazed with the answers you’ll get from that one as well. They won’t be used to it. Also, just meet me anytime at a conference and ask me. You’ll be surprised what you get in return. Number three, the last one and this I wish I’d had, get started. All of you that are faffing around over the design of your website, your logo, your business card, you say, “Well, I’m going to get – I just got to finish off the letterheads and wait till the business cards arrive.” No! Get started now. Ever heard of the Nike thing? “Just do it.” Why do you think everyone uses that? Just do it. What do you think is going to go wrong? Everyone’s got to start somewhere. If you wait till it’s perfect, you’ll never start and you’re missing a chance. I wish I had known this and I still have problems with that. Perfectionism. Yeah I know you’re thinking, “Perfectionism, are you kidding, Jon? How do you do that?” But yeah, it holds me from starting stuff. Now, this one came from Reed Hastings. The single most important thing in business is to go out there and give it a go. Okay? Go out there and give it a go and another line, 50% of the decisions you make will be wrong. Learn from them. But if you don’t get started, you never will. Thank you, BBC. It’s a fantastic article. Look it up. Obviously, their version is better than mine but this information is from them. It is time for a book for the week and this is someone else you will learn from in the same vein. It is called Management in 10 Words and it’s by a guy called Terry Leahy. Terry Leahy was the CEO of Tesco’s in the UK. Now, for anyone in another country, Tesco’s is the UK equivalent of Wal-Mart. It is the biggie. But when Terry Leahy took it over, it was not. It was in the middle, in the doldrums. It wasn’t a quality supermarket and it wasn’t a cheap supermarket. It is in the middle and had nowhere to go. He brought in new methods and he brought in new management style and it all makes sense. 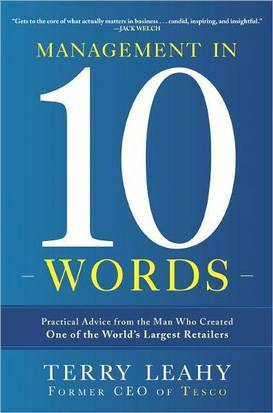 You think “How on earth can I learn from a mega multi-multi-multi-billion dollar supermarket chain?” Well, you can. I did. It’s clever it makes sense. One of the things he brought in was the loyalty card. Tesco was one of the first in the world, possibly the first to use a customer loyalty card and to use the data. So it’s not the card; it’s the data that they learn from their customers to improve what they offer at a local level. Genius. Learn from that which is in effect learning from your customers and doing what they want. Read the book. It’s very readable. Terry Leahy seems to be a great bloke. He’s retired now. He runs another business I think but counting his cash. It is well worthwhile and it’s a book that I plan to read again. It’s one of those needs reading again because it’s so darn good. Trust me. Which of these tips do you need to put into practice?